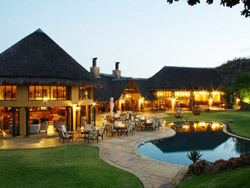 This full day combination tour takes visitors on a tour of both the Pilanesberg National Park and Sun City Resort. The Pilanesberg leg of the tour is an exciting safari-like expedition allowing guests the opportunity to see the African Big Five, namely Lions, Leopards, Buffalo, Rhino and Elephants. The Park is home to large populations of the African Big Five and a variety of other species, such as Giraffe, Cheetah, Zebra, Sable, Hyena, Crocodile and Hippo to mention but a few. Our guests may also select to view the animals in an open-top safari vehicle which adds to the overall safari-like experience. 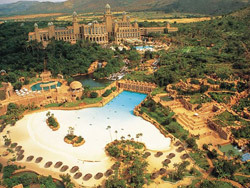 The tour then continues to the Sun City Resort, which is a unique world-class resort with a combination of features unrivalled throughout the world of resorts. The Resort draws thousands of visitors each year to its four top-quality hotels, magnificent sporting and recreational facilities which include 2 world class golf courses, and the magical Lost City water-park, The Valley of Waves. So join us on the amazing tour to experience both the majestic creatures of the African bush and splendour of the magnificent Sun City Resort and Casinos.